The following account is a brief overview of the unfolding and continuing story of three family members of Cardiac Athletes, Coppertone, Intrepid MJ and ‘Tiger’-Lilli. As I write this, in February of 2012, I am a 49-year-old father of three adult children and grandfather of two. Though not a particularly talented athlete, I have lived my life with a definite focus on physical fitness, enjoyment of sport and outdoor activity; on eating sensibly, maintaining a healthy lifestyle and encouraging my children to do the same. For most of my adult life I have trained regularly and participated in a variety of sports as diverse as surf life-saving, kayaking, surfing, triathlon, cycling, mountain running, wrestling, various football codes, multisport racing and orienteering. I made a living in a series of careers that put my sporting and fitness skills to good use, as a sea kayak guide and river kayak and canoe guide, wilderness survival skills instructor, police search and rescue squad member and high angle rope rescue technician. I spent many years coaching and managing junior sporting teams in kayaking, surf life-saving, cross country running and wrestling. Most people who knew me saw me as either a fitness fanatic or a bit of a try-hard athlete, having a go at everything and making the good athletes look even better! I was usually in the second half of the field in most triathlons or running events; sometimes at the very back. I could hold my own in a kayak or surf racing ski and had a few little wins here and there. Though I was never going to threaten the experts on a national level, I still enjoyed training like a world champion – and got much satisfaction just from taking part in any sport and reaping the fitness rewards. I spent most of my life in pretty good health and felt very confident about the fact that I was super fit. From a cardiovascular standpoint I felt that I was in top shape! 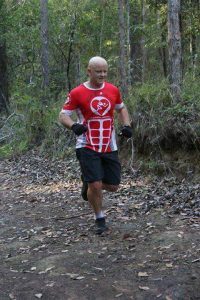 Even at the age of 42, with a pretty stressful frontline policing career, I found the time and energy to train six days a week for the 2005 Coolangatta Gold Surf Ironman Race. It is a gruelling test of stamina and ocean skills. When I completed the event in October 2005 I was ecstatic as I had been dreaming about doing it for many years. I guess you could say that I was at the peak of my fitness and confidence. Read the rest of Tony’s story in our book Cardiac Athletes: Real Superheroes Beating Heart Disease, Volume 1. When bad news calls, it’s the opportunity for a great, positive, uniquely human reaction. But, what we don’t know is in how many ways and over what expanse of time a person may have to “beat” the bad thing. We aren’t Rocky, or Norma Rae, or Scarlett O’Hara. We are just who we are: a collection of experiences and knowledge, with our individual set of coping mechanisms. “Beating” something over which you have no real control is … a journey. My journey began at birth. I was born with a bicuspid aortic valve. Now, back in 1958 there was no ultrasound imaging to confirm this and it was given a variety of vague names, which existed in the back of my mind as I did all the normal kid things, punctuated with yearly check-up visits to St Michaels Hospital in Newark, NJ. I played tennis and captained my high school team, joined the rugby team in college and graduated to post-college power lifting and bodybuilding. Eventually, I left behind any thought of congenital heart disease and moved to NYC, pursued a career, went back to school and became a Physical Therapist, got married and had children. Weight-lifting put too much pressure on the defective valve. But weight-lifting had defined my life and who I was for nearly 20 years! I had to do something else, and that something else was run and bike. It wasn’t easy going aerobic from anaerobic but I slogged along. 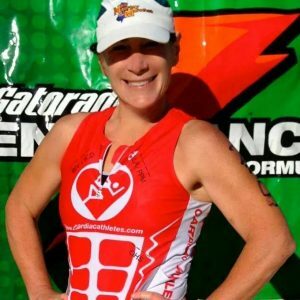 Read the rest of Laura’s story in our book Cardiac Athletes: Real Superheroes Beating Heart Disease. Volume 1. Although we have only featured two here, there are 15 other Cardiac Athlete life stories to read in Book One, and many more coming in Book Two, which will hopefully be published before Christmas 2017. These books could be a fantastically inspiring present for some lucky person. Cardiac Athletes, the future success of this website depends ultimately on you, so Post your stories on the Forum today so that they can uplift and inspire someone else tomorrow! Read about The Pioneers of Cardiac Surgery and Rehabilitation.